Three Sun IPA- interesting, enjoyed the taste, might not pint it as it had heavier malt than I expected, but unique. American Pale Ale- true to style, drinkable. English Pale Ale- not my favorite style, not my fav or their beers. This place is worth a short trip to visit, and for sure worth a stop if you are in that neck of the woods. I visited Shoreline on both ends of a beercation in early July 2010, once for dinner and later for lunch. The atmosphere is nice. Homey and unpretentious with a lot of wood. The place is not covered in TVs either. It was odd that there is no clock. To make things trickier this place is apparently located close to the timezone division between Central and Eastern time. When I asked my server what time it was, he logically suggested checking my cell phone. (It was Eastern time.) The music selection was fun and eclectic. Who cannot love fiddles? As of July 2010, smoking is still allowed. This is becoming a rare thing for me as Illinois and Michigan have eliminated it in bars. The servers are friendly and they don't rush you. They did seem to be pushing the barrel aged bottles a little hard. These were special 750ml bottles from 2007 for $20 each. Since I am a sucker for barrel aged, I did buy 2, but I haven't actually tried them yet, so it remains to be seen whether I made a good investment. There were 12 beers on tap on our first visit and we decided to try them all. They advertised 6 of them as a standard sampler. But it was the other 6 that we found the most interesting. We asked the server if we could get those as samples. He had to ask the manager or something... When he came back he said if we were willing to pay individual prices for each of the samples that it would not be a problem. Sesh Wheat Ale - unlike any wheat beer I have ever tasted. Hoppy, crisp, refreshing session beer. Three Sum Imperial IPA - a little on the malty side for an IPA. Flavorful, but odd. Ly-Co-Ki-We Kolsch - interesting, not great. Hint of sweetness, a bit like corn, but in a good way. Stella Blue - a great smell and flavor. Blueberry balance is carried out nicely. Don't Panic! English Pale Ale - malty, OK beer. There were no bad beers. I cannot help but to compare against other brewpubs, so nothing at Shoreline struck me as exceptional. Three Sum Imperial IPA was a unique take on the style. The food at Shoreline is very good as well. In particular I enjoyed the lamb shank, which was huge and tasty. Overall, I would come back to Shoreline if I was in the area. In fact I did just that when I was on my way back to Chicago from Michigan. It was close enough to the expressway (~4 miles) to justify a lunch stop. First, with the exception of Three Floyds' fancier offerings, this place has the best brewpub food I've ever tasted, and its food beats Three Floyds' everyday food offerings. Nice atmosphere. I hit it twice in one day -- once for lunch as it was just past opening; once hours later to buy a growler in late crowded afternoon. Nice wood and brick and friendly people. The Beltraine Scottish ale is good, and _almost_ cask-like in terms of soft carbonation. The Singing Sands oatmeal stout is very good. The Sum Nug IPA is pretty good -- good hops and slightly sweet malt. The Mug Club mugs are gorgeous. And expensive. You get a great mix of beer fans and folks of all ages, and bar conversation can be fun, and the staff is fantastic. I wish I lived closer to this place. Also, I love the logo, playing off the South Shore train line. We did not expect to find this hidden gem.The Wife and I were referred to this place by a bartender that works at The Livery. She used to work at the Shoreline and is very knowledgeable about her beer. We found many great beers and enjoyed some great food. She had a salad with Shrimp, Feta, spinach, kalamata olives and artichoke hearts. In her words, "mmmmm!". It is a great place to spend the afternoon and also the evening. Once again, like all Indiana Brewpubs, you cannot get beer to go on Sunday. The only place you can get their beer is at the Shoreline and two other restaurants in the area. They had a great selection of beer and the bartender/assistant brewer was more than willing to lend his knowledge. We also found that the locals loved to discuss the Shoreline, as well. You have to love a brewpub that treats it's customers well. In addition, they have some of the most amazing mugs for the mug club. They look like hand blown glass and they are right in front of you at the bar while you sip down the delicious brew. This makes you want to be a member that much more. It's a clean restaurant with a comfortable atmosphere. I would recommend this brewpub to everyone. The Shoreline is located across the street from the Blue Chip Casino and a large Outlet Mall. This makes a great getaway trip. Stopped here on my way home MI for lunch on a Sunday. Not alot of people here at that time. I had the Black Lager as I am a fan of that style and not a lot of brewpubs do it (IMO) I thought it was good, drinkable but not over the top. I sampled the Regular Lager true to style and the APA which was good. The Scottish ale which was a medal winner for them and I did like it, all tho its not my style of choice but it seemed to be the best of the bunch. They did have a lot to choose from but a few repeats of IPA's not sure how different they were descriptions where little fague. Food wise the menu had solid pub fare choices and I was there with wife and kids and everyone was able to fine something and no one had complaints. Pull Pork wrap was good and I did enjoy the fries reminded me of fries I was able to get out on the east coast. Certainly worth a stop if your in town over at the casino or across the street at the outlet mall. Also they had a chalk board with current styles on tap and brews in the works, nice to see whats coming up down the road. Suggestion maybe a guest tap or two?? I hadn't really heard of Shoreline until we began planning a brewery tour in north/west Indiana. We easily found Shoreline just a few minutes from a well-know casino in Michigan City. They offered on-site parking, so in we went. The bar and main restaurant are well-developed and well-lit. This is not your typical small brewery cave atmosphere. From memory, they had 9-12 brews on tap, and a great sampler flight. Their board also showed the next 9-10 beers on deck. Nice idea. Several of their medium-darker beers showed some interesting smoke character. We enjoyed everything we tasted, and took a growler of the Don't Panic English Ale with us. Our tood was great, as was our host Tiffany. Check out Shoreline! We'll be back. I sampled both the IPA and double IPA at Shoreline. The single IPA was very bitter (IPA's are not really my style of beer). The double IPA was less bitter and did not mask the high alcohol content very well. They had several other styles of beer but no porter or stout. Maybe they do not brew dark beers in the summer. At any rate, a porter or stout should be added to the beer menu. I went to this place a while ago and cannot remember all the details about the sampler I had. I did not like how you could not choose any of the beers on the sampler, especially since a lot of them were similar (pale ale, English ale, IPA, American Pale ale). Like I stated earlier I cannot remember the detail about the beer, but I do remember that I was fairly disappointed with the aroma of the beers. The American Pale ale was especially disappointing. The beers also got significantly worse as they warmed up, they need to be drank ice cold. The atmosphere is very blue collar and woodsy, and has a strong cigarette smell. They do have a non-smoking section the does a good job from keeping you secluded from the odor, but it also makes you feel secluded from everything. Also, the prices weren't outrageous, but definitely exceeded the quality and what I was expecting. I nice little gem hidden close to The Lighthouse outdoor shopping center, and Washington Park. Sam and Layton usually have 6 to 8 different varieties on at a time. My favorites are the Imperial Stout, Sum Nug, and 3 Sum. I've never had a meal, but the apps that I've tried have certaily hit the spot. The bar back has window that let you look into the brewhouse. The entire bar area is the smoking section. There is a small family section off to the side. Even with that, I wouldn't really consider it a family friendly place. Still, I visit every time I make it back to the area. 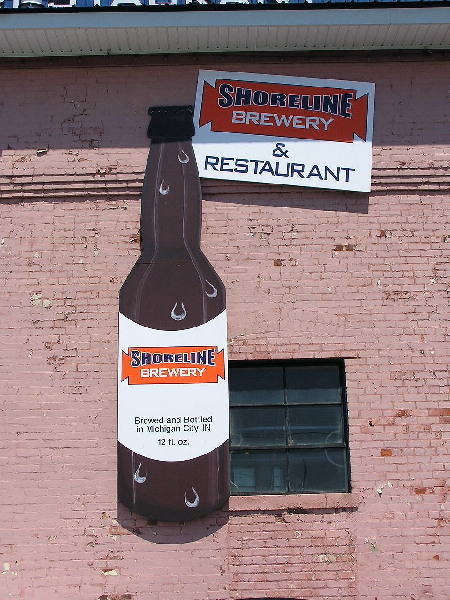 Shorelineâ€™s brewery and brewpub are located in an old industrial building that once serviced the nearby power plant. The interior is very nicely done in exposed red brick and white pine. Growlers and pints from other brewers, beer related posters, and artwork are used for decoration. 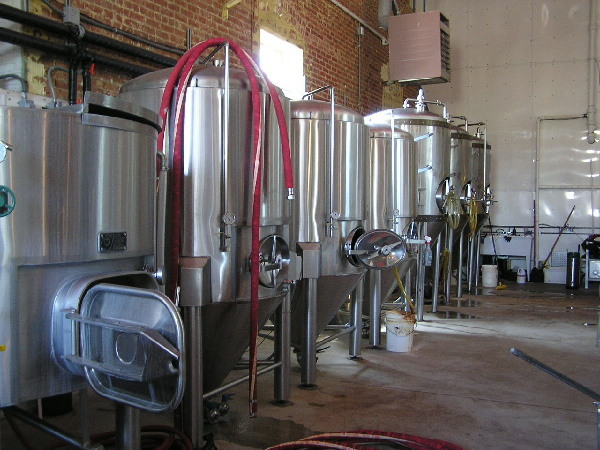 The brewing tanks are visible behind the bar. There is a small wooden bar with roughly 15 stools. Numerous 4 chair tables are the remainder of seating. Indoor smoking is allowed anywhere in the bar, but there is separate non-smoking section. On this visit I did not order any food, from my previous visit I can tell you that the food is very good here. All the patrons here were having and enjoying their lunches. One of the complaints I hear most often about this placeâ€™s beers is that they are not anything over the top. I have always found their beer to be solid examples of the styles. As if they had also heard this complaint they have begun to brew Bennyâ€™s APA which they refer to as a â€œWest coastâ€ APA. I found nothing West coast about it. The IBUs just are not there. I tried the Sum Nug IPA, and the Three Sum IIPA with the same results. Their website showed a Russian Imperial Stout, but this was not available during this visit.